Bobotie has been recognized as South Africa's national dish. With influences from the spices of Cape Malay, Dutch ​settlers, and local cooking, it is no wonder that Bobotie is the rainbow nation's national dish. Bobotie comes in a wide range of varieties, however, a traditional bobotie is said to have 6 key elements that influence the flavor and texture. The essential ingredients are curry powder, cinnamon stick, jam or chutney, raisins, bread soaked in milk and bay leaves. Bobotie is normally served with a spicy yellow rice, but this could also pair very well with a fragrantly spiced rice such as pilau, roasted masala spiced root vegetables or enjoyed on its own with a side of salad. In order to accommodate people with a variety of diets, I have created a vegetarian or vegan alternative. Fry the onions, garlic, and ginger in vegetable oil. Add the cinnamon stick, curry powder and ground coriander to the pan and allow to temper and become fragrant for about 30 seconds. Rinse the green lentils then add them to the pan, followed by the 2 heaping tablespoons of jam. Add the vegetable stock and water, bring to a boil, then simmer for 40 minutes. While this is simmering, soak 2 slices of bread in some almond milk. Add the soaked bread and the raisins to the bobotie after about 30 minutes of simmering. Work the soaked bread into the bobotie until it is smooth. Make the custard by following the instructions on the Bird's custard pack and simmer until ready to use. 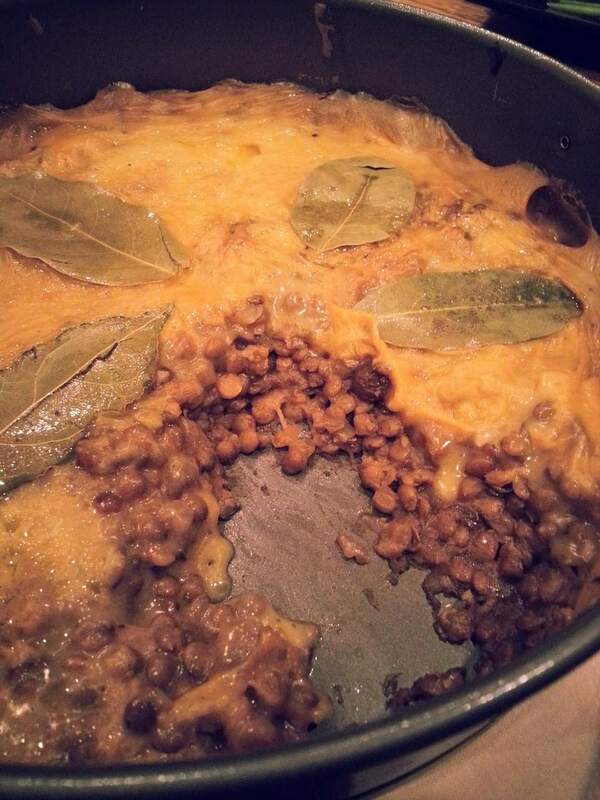 When the lentils in the bobotie are cooked, place them into a square or round baking dish. Top with the vegan custard. Arrange 5 to 6 bay leaves on top. Melt and pour over the vegetable margarine/vegan spread to make it glisten and bake at 180 degrees for 25 to 30 minutes. The aroma from the bay leaves will infuse into the custard and fill the room. Serve with rice.